A large number of Easter eggs will be hidden about the gallery (both inside and out – hoping it doesn’t rain!!!) for patrons to hunt for and discover. Each egg will contain a special ticket, good for one of many prizes to be redeemed that evening, including the grand prize, a framed one-of-a-kind original drawing from Brandi herself. 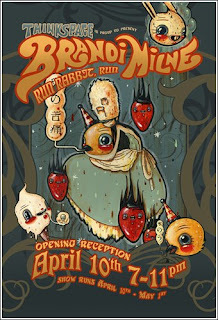 Other prizes will include limited edition giclee prints, copies of Brandi’s latest book with Baby Tattoo “So Good For Little Bunnies”, one-of-a-kind original sketches, one-of-a-kind hand-made creations from Brandi, copies of her new Gelaskins, and much more. Run Rabbit, Run is the first solo exhibition at our gallery from Los Angeles-based artist Brandi Milne. Run Rabbit, Run will feature a new fantastical world of whimsy painted with acrylic on wood panels and a collection of hand-painted antique books that will make up a very special installation. FYI: There will also be a special ‘Easter Egg Hunt’ presented by Thinkspace and Brandi Milne taking place during the opening reception. Details will follow on this soon, but there will be several unique prizes awarded throughout the evening to patrons lucky enough to find one of the special eggs that will be hidden inside the gallery and out during the opening reception. 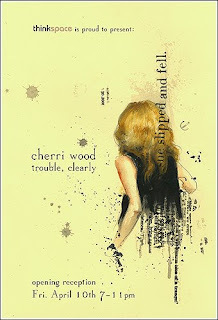 Cherri Wood is a young illustrator that is based out of Minnesota. Her watercolor and ink studies explore various areas of the human psyche such as alienation, childhood idiosyncrasies, and general psychosis. Each drawing contains quotes and dialog culled from a plethora of classic plays and short stories helping to narrate each work in its own special way. 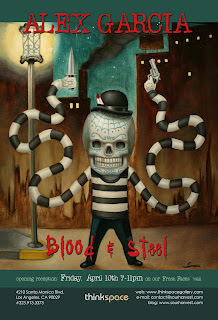 She is deeply influenced by independent films, graphic novels, comic art, and photography. In the new series of works for trouble, clearly a variety of methods and mediums have been used in the creative process such as staining patterns created with tea, floral material, caramel soda, and various juice mixes along with acrylic paint and india ink. Wood has shown with Andenken Gallery, Carmichael Gallery, Gallery 1988, Project: Gallery, O Contemporary/Opus Underground, and also took part in this past year’s GenArt Vanguard Fair that took place during Art Basel in Miami, FL. We’re honored to be hosting her debut Los Angeles solo show and look forward to all getting a chance to see a large body of work from this emerging artist. 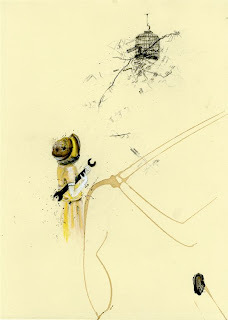 Alex Garcia returns to Thinkspace after having his debut solo show with us back in September of 2007. He’s been busy as a tattoo artist out in Studio City at Dolorosa Tattoo, and is now setting his sites on getting back in the art game. 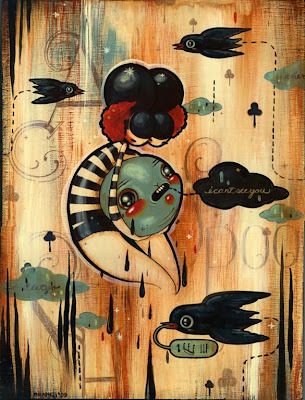 We’ll be getting add’l new works in from Garcia throughout the year as well. We’re really looking forward to having him back with us this April on our ‘Fresh Faces’ wall in our project room. Look for interviews to be posted with each artist in the coming weeks.